Adobe’s newest addition to Premiere Pro is something called Motion Graphics Templates. In short, they are pre-made graphics from After Effects that can be imported into Premiere Pro and altered in Premiere Pro using a simple set of controls. After Effects templates, like the ones offered at Motion Array give users full control of changes and updates, as long as they are done in After Effects. A user can then render the graphics and place them in Premiere Pro for editing, but any further changes to the graphics need to be done in After Effects. Motion Array also offers Premiere Pro templates that allow users to alter graphics inside of Premiere Pro, but they are built directly inside of Premiere Pro and therefore don’t utilize the After Effects tool set. Motion Graphics Templates bridge the gap between the two. Essentially, a designer can build graphics inside of After Effects, and use a new feature call the “Essential Graphics Panel” to make simple edit controls. The After Effects designer can drag and drop commonly used effects into the panel, where basic controls like sliders and checkboxes will appear. The new Essential Graphics Panel aims to make workflow easier for the non-advanced user. Once the graphics are completed and the proper effects controls have been added to the panel, the After Effects user can export a Motion Graphics Template file. 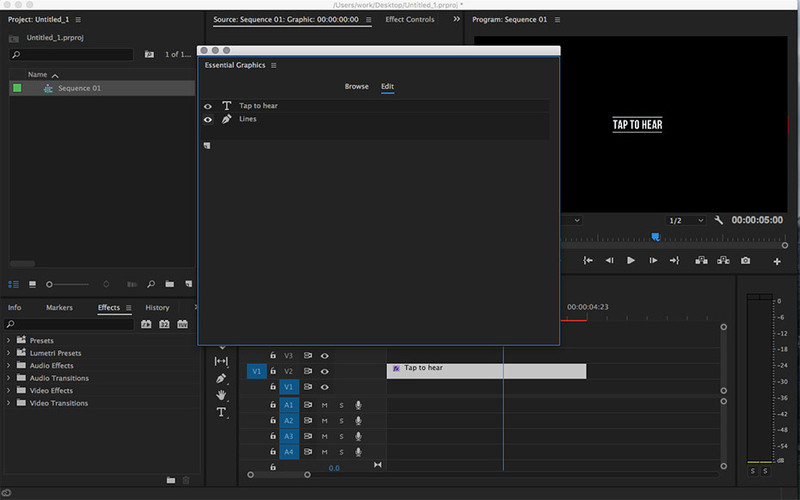 Then that template can be imported into Premiere Pro where the same Essential Graphics Panel will be displayed. The editor can then easily make tweaks to the graphics from this panel without ever having to go back into After Effects. So, why is this a great addition to the Adobe CC suite? First off, it’s wonderfull or designers who build something great in After Effects that they need to hand off to an editor when they don’t want the editor to break anything or make dramatic changes. In many professional environments, a motion graphics designer will have to hand off source files. An editor, producer, or client may not have a full grasp on the inner workings of AE, and they could mess up something in a project while trying to make a tweak. The new Essential Graphics Panel gives the designer control to set what parameters can and can’t be changed, and it makes them easy for the end user to update without a vast working knowledge of the program. Also, this new feature is great for template creation and use through marketplaces like ours at Motion Array. We can now create steller After Effects templates that don’t require After Effects to update. A user who is only familiar with Premiere Pro can grab a Motion Graphics template and get to work with it, using the simple controls to make tweaks and changes on the fly. To use a Motion Graphics Template, you’ll just need the latest version of Premiere Pro (Currently Premiere Pro CC 2017). Once you download the template, you can import it into Premiere Pro by clicking the Graphics tab, then selecting “Install Motion Graphics Template”. The Essential Graphics Panel will open allowing you to navigate through the various elements in your template. A template can house several different graphic elements. Once you add a graphic element to your sequence, double clicking that graphic will bring forward the Edit portion of the Essential Graphics Panel. Here, you can make whatever changes are available for that particular graphic. It’s a really simple way to get customization on graphics easily without having to dig into parameters and without having to load After Effects. We think Adobe has made a smart choice to add in this feature that will help After Effects designers and Premiere Pro editors work together more easily and without causing a lot of headaches when it comes to customization. We also think Motion Graphics templates will be a great addition to the Motion Array library, and we are really excited to be the first marketplace to being Motion graphics Templates to you.